The moment I laid eyes on this book I fell in love with it. The super cute cover is reminiscent of the modern country style patterns from Cath Kidston and Laura Ashley (both of which I adore), I can often be found rummaging around in second-hand stores for random old (I mean, vintage) bits and bobs and I love castles and handsome Scottish men - so having all these things combined made it sound like the perfect escapism read to me. As soon as we are introduced to Evie I felt like I had found a new friend in her. Not only is she a sweet and very likable main character, but she also reminded me of myself in many ways and I don't just mean that we're both hoarders. She loves anything vintage, is a bit of a dreamer and even if she doesn't admit it out loud, she's holding out for her very own Prince Charming - and let's face it, aren't we all? Despite Evie seemingly having it pretty together, those around her don't see it that way. 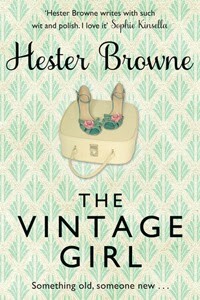 Her biggest passion in life is collecting vintage items yet her sister and mother want her to be more minimalistic like them and even her boss Max, despite owning an antiques store, doesn't understand her love for old things and so they all pressure her to give up the one thing she loves the most. What they don't understand is that to Evie this isn't just old junk, but each and every one of the items in her collection have a story attached to them. They've been held and loved by people decades before which is something that Evie finds very romantic, and I can't blame her - it certainly made me look at second-hand things in a different way. When Evie is asked to visit an old castle up in Scotland for the opportunity to use her expertise in valuing some of the items so the new owners can use the money to pay for the castle's upkeep she doesn't have to think twice. The opportunity to look through all the riches that have been collected there over the course of the last centuries is a dream come true for Evie. And when she arrives at Kettlesheer Castle she not only finds a wealth of old furniture, letters, diaries and other fascinating items from a lifetime ago, but also a place in the final stages of being prepared for a traditional ball - which definitely appeals to the hopeless romantic in Evie. I'm normally not a girly-girl and balls and fancy dresses don't do much for me, but the inviting way author Hestor Browne described the grand ball in this novel and the reeling that goes hand-in-hand with it, had even me wanting to go back to Jane Austen's time so I could pull out my dance card and fill it with the names of all the handsome Scottish men present. Sweet and romantic, The Vintage Girl can only be described as a modern-day fairytale. I loved reading about Evie and the history of the castle's owners and thought the book was pretty close to perfect. I only wish it hadn't been quite as predictable as it was, but luckily the journey to the inevitable ending was full of obstacles, surprises and quite a few hilarious moments, making this an utterly delightful read overall.